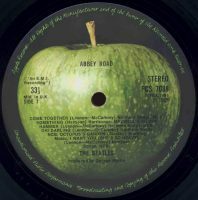 Overdubs were added to three Abbey Road songs during this 2.30pm-midnight session. It began with more recording for Maxwell's Silver Hammer. George Harrison added extra lead guitar to the choruses, then he and Paul McCartney taped more vocals to the final line, "Silver hammer, man". Attentions then returned to Something, which had been started in May 1969 but left unfinished. On this day Harrison recorded his lead vocals, which he double-tracked in the choruses. The eight-track tape was now full, so a reduction mix was required to allow for further work on Something. This mix was numbered take 37, and combined the piano and lead guitar onto track one, and both vocal tracks onto track seven. 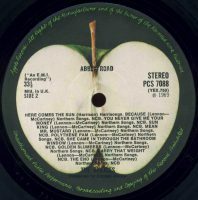 Otherwise the recording was unchanged: drums remained on track two, bass guitar was on five, rhythm guitar was on track six, and Billy Preston's organ part was on eight. It has been reported that Harrison later re-recorded his lead guitar part during the 15 August orchestral overdub session. However, the take 37 reduction mix made on this day contains Harrison's final solo, recorded on 5 May. Tracks three and four were left clear for the time being. Harrison re-recorded his vocals later that week, however, rendering this reduction mix unnecessary. Four rough stereo mixes were also made during this session. The session ended with a bass guitar part added to You Never Give Me Your Money, which was played by Paul McCartney and recorded onto track seven of the tape.